Nearly one year ago, FIU embarked on an international effort to support environmental conservation efforts in the Andean Amazon region of South America. Awarded a nearly $750,000 grant by the U.S. Agency for International Development (USAID) through Higher Education for Development, FIU partnered with the Pontificia Universidad Javeriana and the Universidad de la Amazonia to develop a research collaboration network in Colombia. The network also included Fairchild Tropical Botanic Garden (Miami), the Field Museum of Natural History (Chicago), and Instituto de Investigación de Recursos Biológicos Alexander von Humboldt (Colombia). Since its inception, the partnership has resulted in strengthened research collaboration networks, professional development workshops and citizen-science programs in Colombia. 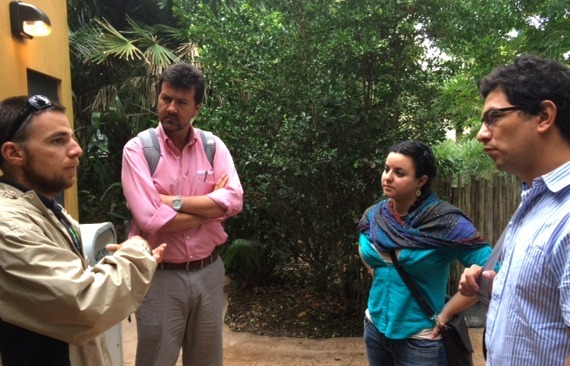 Maldonado (far right) meets with Zoo Miami officials during his trip to FIU. It has also signed on more than 10 additional organizations as partners, including the U.S. Department of the Interior, Conservation International, and Tropenbos International Colombia, to support the initiative. To mark the first year of the research network’s inception, Maldonado came to Miami to meet with colleagues at FIU and to strengthen ties with local organizations– including Zoo Miami, which recently launched a new conservation program to bolster its ‘Amazon and Beyond’ exhibit. The research collaboration network will continue to work to further expand academic programs, including a graduate level course on field research techniques; scholarships for student research; a citizen-science initiative in secondary schools; and conferences on Amazon biodiversity conservation. I will love to be involved in this amazing project. I am a recent Environmental Studies graduate, please let me know where can I get information on how to get involve. Hi Gabriela. Thank you for your interest in our project. Please email me at alemosja@fiu.edu so we could give you more information and find ways to be involved. Thanks!